When people go home – what happens next? How do you canalise the tidal energy of a protest or social movement until it effects change? At a Podemos London event, we begin to find out. October rolls around, and once again British party conference season is over for the three main parties – Labour, the Conservatives and UKIP. Older readers may recall a time when the final fragment of that sentence looked slightly different. The Liberal Democrats, the party that promised it would say goodbye to broken promises, are themselves being waved off with a snotty hanky, polling at about 7%. Some people will tell you that schadenfreude is not a defensible or moral political position, but they are wrong, and you should challenge them to say the word 'Cleggmania' with a straight face. This graph of average opinion polls makes clear Britain's new party political reality. Many people outside Spain will have noticed Podemos in the European election coverage in May, as the one bright spark in a continent once again darkened by the shadows of gloomy nationalisms. Here, at least, was some small consolation: one energetic new party run by the people, rather than petty bourgeois proto-fascists. In a sense, their story is as simple as it is spectacular: Podemos were founded in January 2014, and in a matter of months they had won 1.2 million votes and 5 seats, doing so with a campaign budget of only 150,000 Euros. Meanwhile the two parties who have run Spain since the death of Franco collapsed: together, the PSOE and PP got 49% of the vote; down from 80.9% at the previous European election. The two-party system has been shattered, and it is becoming ever clearer that Podemos's success was neither a protest vote nor a one-off, but the first triumph in a remarkable upwards trajectory: last week they polled 19.9% to PSOE's 20.2% and PP's 26.9%. Already it seems certain that the Spanish electoral landscape will never be the same again. Keen eyes will have noticed that this column is called Revel, Riot and Rebellion – after a (terrific) book about seventeenth century England – and does not normally dwell on electoral or party politics. But what is so remarkable about the rise of Podemos is that they answer the question I have asked so often since 2010, to friends, to myself and at length in this column: what happens when the music stops? When the kettle is released, when the protest camp is cleared, when the social centre is evicted, when the spurious mass arrests have been thrown out of court, when people go home – what happens next? How do you canalise the tidal energy of a protest or social movement until it becomes an irresistible current, and effects far-reaching change? Podemos – the direct heirs to the 2011 indignados movement – seem to have found the answer, and a couple of weeks ago I went to see it in action at a very different kind of party conference: the Podemos London Assembly. With Spanish youth unemployment remaining steadfastly above 50% (53.5% at the last count), a growing minority of the party's natural voters, the young and indignant, are now here in the UK (and Germany, France, the US and Canada), by force of economic necessity. Attracting a packed crowd of 250 at the London Welsh Centre, with more attendees watching via a stream in a spillover room, the Podemos London event received widespread coverage in the Spanish press. It's easy to see why – contained in its attendees' personal stories of economic exile was the very reason Podemos were needed in the first place. “We're all here in the UK because there is no work,” said Tony, projecting his resentment at what was going on back home: “they are terrified of us. Democracy needs a lot of voices, and now we're finally making ourselves heard.” La casta – Spain's ruling class, from the bankers to the MPs to the royals – is now seen as so corrupt, self-interested and incompetent that it is beyond redemption. 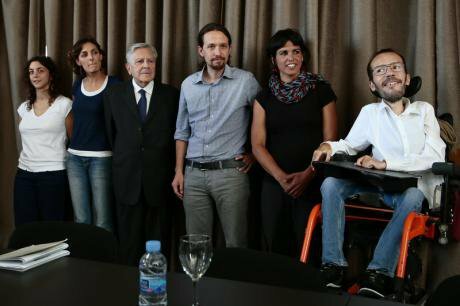 Pablo Iglesias, leader of the political party 'Podemos', which is the fourth political force in Spain, gave a press conference for the first time after the great support received in the European elections. Hugo Ortuño/Demotix. All rights reserved. Tony and his fellow exiles seemed proud of the list of speakers they'd assembled: American academic Cristina Flesher, Land and Freedom director Ken Loach, Owen Jones, Podemos MEP Tania González and their European election strategist Íñigo Errejón. Tellingly, the discussion was not of polling numbers or target seats but the party members' ongoing work on the streets: of the marches for dignity, against unemployment, of the PAH anti-eviction movement, of actions against the privatisation of hospitals, and in defense of undocumented migrants. Above all, the emphasis was on people's active involvement in Podemos – the party is built on over 1,000 regular 'circulos', horizontally-organised, locally-held meetings, or 'circles', and their determination that Podemos be a truly internally-democratic party is both sincere and appropriately complicated: witness the two month grass-roots process to select candidates and general election policies outlined here. As young Spaniards filtered into the room and the members of Podemos Londres darted around arranging microphones, chairs and cameras, Cristina Flesher pointed out that Podemos's energy, networks, and political acumen did not drop out of the clear blue sky. “So many of them are seasoned activists with 10 or 15 years experience – for years they've been building to this moment, putting in the groundwork.” She described the current moment as “a new democratic transition” - an updating, and a corrective, to la transición of the late 1970s. That transition was managed by the political classes – including Franco's former lieutenants, the likes of Manuel Fraga, who founded the PP, but also, from the exiled opposition, people like the leader of the Spanish Communist Party, Santiago Carrillo. It sounds trite to say, but if this really is a new democratic transition – which you could periodise as starting with 15M, perhaps – this time it is being managed, to an astonishing extent, by the people. This wave of populism is also reflected in groups like PAH, who can count on an astonishing 90% support. Podemos are at once anti-capitalist but also beyond the traditional Spanish left, its Eurocommunists, election-snubbing anarchists, lapsed socialists and regionalists, and this recalls the indignados slogan: 'we are neither right nor left, we are coming from the bottom and we're going for the top'. In my column last year about the latent energy that persists after a mass movement fades from view, I quoted a friend in Barcelona reflecting on the manifold smaller battles going on in the wake of 15M – against the closure of social centres, against dodgy bosses, against evictions and destructive employment and health legislation: “Things are all very ‘molecular’ right now”, he said. I have contacts across Spain of all different ages and parts of the left – formal, informal, old, young, rural, urban; all of them seem to be involved in Podemos right now. The molecules are forming into an entirely new organism: one that is untested, and is facing a series of predictable but nonetheless huge obstacles (among them, co-option, exhaustion, slander and conservatism), most of them set up by the mighty resistance of la casta. Our dreams don't fit in your ballot boxes, ran the indignados slogan. We are about to find out if they do.